Sixty-eight years after the Calgary Stampeders capped off an undefeated season with their first ever Grey Cup victory, many of the traditions that started on that fateful weekend in 1948 are still going strong today. Pancake breakfasts, Stampede queens and princesses, and of course, a horse in the lobby of a Toronto hotel. While it wasn’t the first Grey Cup game, that weekend has been credited with starting the tradition of the Grey Cup party. As the legend goes, in 1948 a group of Stampeders fans travelled via train along with a dozen horses and made the trek from Calgary to Toronto to watch their beloved team participate in the 36th edition of the Grey Cup. When they arrived in the city, the group rode their horses from Union Station right into the lobby of the nearby Royal York Hotel. It wasn’t the prestigious Royal York Hotel that hosted this special equine guest this year, likely due to resistance the hotel gave the Calgary Grey Cup Committee in 2012. No, this time it was the Holiday Inn Downtown Centre on Carlton Street that decided to pick up the torch, much to the delight of CFL fans nationwide. 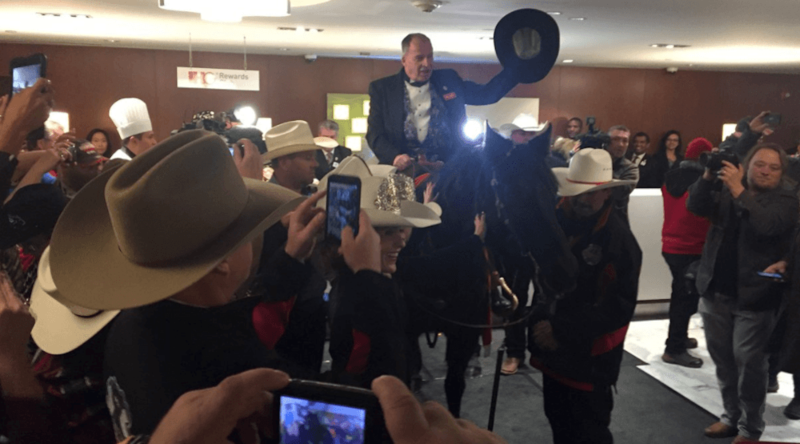 To mark the arrival of Marty the horse, who is standing in for the elderly Tuffy who is on strict travel restrictions, bagpipers from the Calgary City Police serenaded the gathering of fans and media in the lobby of the hotel. Calgary Grey Cup Committee chairman Phil Landon rode the horse into the hotel, where Marty ate some carrots, and crapped on the floor. He’s still a horse you know. Just like in 1948, the 104th Grey Cup will feature a matchup between Calgary and Ottawa this Sunday in Toronto.